Prior to our Baguio trip last January, I already made a mental note to dine at Bliss Cafe simply because I just heard about it. 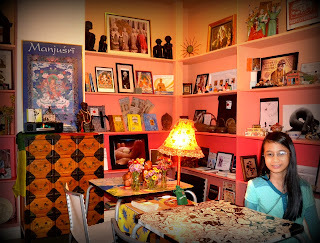 And also, the owner, Ms. Shanti Isla is a friend. So I bugged W and M until they agreed to dine there. Actually, I was a bit apprehensive about W and M's family dining at Bliss Cafe since it is a vegetarian restaurant but M assured me that they are "anytarians." Great! Bliss Cafe is conveniently located at Hotel Elizabeth along Gibraltar Road. Simply tell the cab driver to take you to Hotel Elizabeth or if you are driving, it is near Minesview Park. Vegetarian BBQ. Little Bear enjoyed this. Vegetarian Adobo. Wasn't able to taste this but W and M commented that its good. Paneer Set. I ordered this for me but daughter ate most of it. We both love this dish. Yum! I don't have any idea what this is. W ordered this. We all had a marvelous time at Bliss Cafe. The dining experience was truly blissful.